Macau (Macao SAR) – October 10, 2018 (travelindex.com) – Spearheading discussions about global tourism economy in the context of China’s far-reaching Belt and Road Initiative, the Global Tourism Economy Forum (“GTEF” or “the Forum”) will hold its seventh edition in Macao on 23 and 24 October. 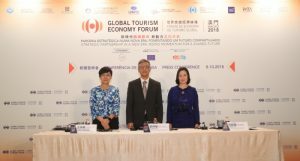 Under the theme “Strategic Partnership in a New Era, Rising Momentum for a Shared Future”, GTEF 2018 takes a holistic approach in this edition to examine the impact of strategic tourism collaboration between the European Union (EU) and China in the 2018 EU-China Tourism Year (“ECTY 2018”), and the enormous latent opportunities in the Guangdong-Hong Kong-Macao Greater Bay Area waiting to be explored. A pre-event press conference was held at MGM Cotai on 8th October. It was attended by Chief of Office of the Secretary for Social Affairs and Culture of the Macao Special Administrative Region Government, Ip Peng Kin; Director of Macao Government Tourism Office (MGTO) and Vice Chairman of GTEF, Maria Helena de Senna Fernandes. Vice Chairman and Secretary-General of GTEF, Pansy Ho, presented the program of GTEF 2018. As an Official Partner of ECTY 2018, GTEF celebrates the special tourism year in its 2018 edition by featuring the EU as the Partner Region, and Guangdong Province as the Featured Partner Province. Under the topic “Strategic Partnership – Building Bridges of Cooperation for Shared Benefits”, ministers and global private-sector CEOs will discuss how the framework of ECTY 2018 has served as a precursor of deepened China-EU cooperation in tourism and an enhancer of extensive and sustainable economic growth on both sides. Signing ceremonies for a series of cooperative agreements will be held on the day of the Forum opening. Tourism, Trade and Business Presentation and PET Conference, among other sessions. Further, the fifth UNWTO/GTERC Asia Tourism Trends will be launched during the Forum. A joint effort of the World Tourism Organization and the Global Tourism Economy Research Centre (GTERC), the report will present tourism trends and outlook of the region, analyze Chinese Outbound Tourism to Europe and European Union Outbound Tourism to China, and examine the development potential of the Greater Bay Area, a new growth area of Asia. Last but not least, networking, investment and cooperation opportunities including business matching, destination presentations and exhibitions will be available for delegates’ benefits. GTEF 2018 is honored to have ACFIC, PATA, WTCF, UNESCO, The Macau Chinese Enterprise Association, China Daily, UBS and Ivy Alliance Tourism Consulting as supporting partners and sponsors of Forum sessions, among others. Please stay tuned for more information via www.gte-forum.com and its social media channels. The Global Tourism Economy Forum (GTEF) is hosted by the Secretariat for Social Affairs and Culture of the Macao SAR Government, in collaboration with World Tourism Organization (UNWTO), co-organized by the China Chamber of Tourism under the authorization of All-China Federation of Industry and Commerce (ACFIC) and coordinated by Global Tourism Economy Research Centre (GTERC). GTEF’s supporting units include the Ministry of Culture and Tourism of the People’s Republic of China (invited), All-China Federation of Industry and Commerce (ACFIC), the Liaison Office of the Central People’s Government in the Macao SAR, Office of the Commissioner of the Ministry of Foreign Affairs of the People’s Republic of China in the Macao SAR, Macao Government Tourism Office (MGTO), World Travel and Tourism Council (WTTC), Pacific Asia Travel Association (PATA), World Tourism Cities Federation (WTCF) and European Travel Commission (ETC).